“I said to him, ‘You are going to wind up getting a lot of people killed because you are counting on the white man having a conscience,’” John Marshall Kilimanjaro, also the secretary of the local NAACP at the time, told King. 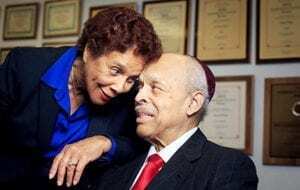 those in power to listen, died at the age of 88 on Wednesday, March 27, 2019 — the day the weekly newspaper is printed. His wife of 62 years, Vickie Kilimanjaro, was at his side. “After I pulled myself together, I asked her, ‘You mean he died on press day?’” said daughter and Peacemaker editor Afrique Kilimanjaro, who moved back home years ago to help run the newspaper. She has to smile. Her father, she knows, would have demanded it. As colorful as Don Quixote, as militant as Frederick Douglass and admittedly arrogant at times, the man born John Marshall Stevenson chronicled important events in the life of the city and came to be considered one of its best-known voices. He also founded the theater arts program at A&T and the N.C. Black Publisher’s Association. His many honors include the Order of Long Leaf Pine, the state’s highest civilian honor for public service. “I think his legacy will be that he ‘told it like it was,’ and it wasn’t always comfortable for some people,” said Bob Davis, a retired N.C. A&T sociology professor and Omega Psi Phi fraternity brother of Kilimanjaro’s newspaper work. Kilimanjaro, born in Little Rock, Ark., had a master of arts, speech and theater arts and a doctorate of education from the University of Arkansas. He disavowed his family’s slave name of Stevenson for one with African meaning. His final choices: Mandingo for the people of West Africa or Kilimanjaro for the famous African mountain. He had converted to Judaism at age 18, in part because of Jewish involvement in the civil rights struggle. One day in the 1950s, after joining A&T’s faculty as a drama professor, Kilimanjaro, stopped by to see Rabbi Frederick Rypins at Temple Emanuel. “I asked him if he would have any trouble with my coming to service,” Kilimanjaro has said. “I wanted to know if there would be a problem. In Pine Bluff (Ark., where he had previously lived) there had been a problem. They’d sent a delegation to my home … telling me they were afraid they’d get bombed. “Rypins simply said … ‘Come on,’ “ Kilimanjaro recalled. A classical pianist, he could still silence a room with the first few notes of Beethoven or eloquently recite chapters of the Psalms and Shakespeare not so long ago. At other times, he he had to search for his words. Yet at the same time, he could readily share his thoughts on topics such as race and poverty — and could be animated and persuasive. He used words others might have to look up in a dictionary. He had been forced to give up driving decades ago, when the sleep disorder narcolepsy forced him to pull to the side of the road as many as four times between his home off West Friendly Avenue and the newspaper building on Summit Avenue. An episode would cause him to fall into a trancelike state with his eyes closed. Increasingly, those symptoms included attacks of cataplexy that sometimes caused him to collapse to the floor head-first. The class looked on in disbelief. “Did I just say something about three little pigs?” he asked. When they nodded, he walked out in tears. He’d been to doctors of all kinds but to no avail. “I got the diagnosis, but being able to do something about it was something else,” he said in 2007. 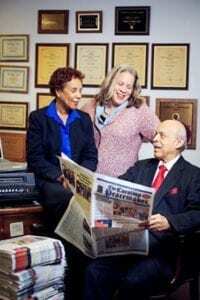 All along, he had been putting out the newspaper, whose coverage included the battle to desegregate schools and the fight for a district system that would make it easier for local black people to be elected to political office. Kilimanjaro had placed a famous King quote — “Live as brothers, die as fools” — on the masthead of the paper, where it remains today. And he set about highlighting the achievements and struggles of African Americans in Greensboro and beyond. Kilimanjaro knew his would be a paper that took stands on politics — unlike some of the forerunners aimed at Greensboro’s black community that mainly printed stories about social events and obituaries. Only, he’d never worked at a newspaper. 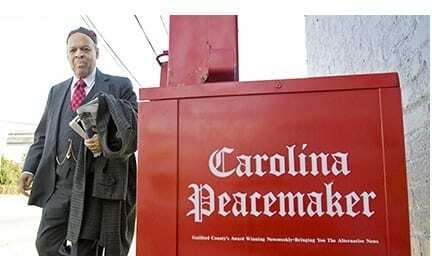 What he did have was Charlie Womack of Danville, Va., whose father had other newspaper investments. Womack put up $6,000 as a silent partner and taught Kilimanjaro about layout and design. The honeymoon lasted about two months. But the newspaper did get noticed. Kilimanjaro’s was an ego so strong that the paper over the years became a reflection of his anger and pride. “I think that he exposed a lot of stuff through Old Nosey,” Ernie Pitt, a journalism school graduate who worked for Kilimanjaro before starting the Winston-Salem Chronicle, said years ago. “I suspect Doc handled it that way because when you do an investigative story, it takes time and resources, and most weeklies I know of don’t have time to put a reporter on one thing that may take six months to ferret it out,” Pitt said at the time. The paper defied economics for a long time, but Kilimanjaro never missed a deadline. At times, the Kilimanjaros reached into their own bank account to make payroll. But the lure of easy money didn’t move him either. Davis recalls going with the other members of a bond referendum committee to seek support from Kilimanjaro. Someone in the group mentioned they were planning to buy an ad. His reputation, however, would take a major hit when a former A&T intern sued him in 1994 and won $55,000 after alleging he touched her and made sexually suggestive gestures. Kilimanjaro, who continued to maintain his innocence, wouldn’t settle to avoid a public trial. and has written environmental policy for the federal government. Although he applauded his daughter’s efforts, before his diagnosis became too pronounced, he wondered if the time had come to sell. He didn’t want his wife to worry about keeping the newspaper afloat when they should be enjoying retirement and grandchildren. As part of his legacy, the lobby of the Paul Robeson Theatre bears his name. Kilimanjaro, who founded the theater in 1970, would go on to produce more than 80 plays and musicals. Still, the Peacemaker was a household name. Even with its highs and lows, the Peacemaker has also done what Kilimanjaro set out to do, and that’s to get people talking — and thinking, Davis said.